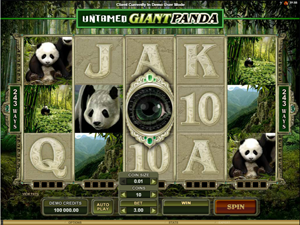 Untamed: Giant Panda is a wildlife-themed slot machine of the Untamed series released by Microgaming. You will take a memorable journey to a lush Chinese forest inhabited by fluffy pandas and will try to take down a 7500-coin jackpot. This striking video slot has a whole array of features, including scatters, wilds, Brilliant Wilds, Lucky Nudge and a way-out customizable Gamble feature for an unrivalled gambling experience. 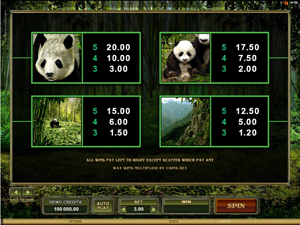 In this game, Microgaming has done away with a traditional system of win lines equipping the Untamed: Giant Panda slot with five reels and 243 ways to win, so the game will award you a win whenever 3 or more identical icons land on adjacent reels. The minimum bet per spin you can set down is $0.3. By tuning a coin size (from $0.01 to $0.1) and the number of coins (up to 10), you can reach the ceiling of $45 per spin. With its theme rotating about nature, the symbols depict giant pandas and breath-taking wildlife landscapes – these augmented by playing card icons (10, J, Q, K, A) with the highest payout of x80 times a bet. The best money-bringing regular symbol is a close-up of the panda’s head that pays out x200 times a bet if five appear on adjoining reels. The Untamed: Giant Panda logo represents a wild symbol that can act as a substitute for all symbols, rather than scatters. In this slot, the wild is used in a fairly innovative way. Under each of the five reels, there is a progress bar divided into four sections. Every time a wild symbol hits a reel, a small token looking like a wild’s miniature fills in the progress bar for that reel. Once all the four progress bar sections get filled in, the entire reel transforms into wild for the next four spins enhancing your chances to score big and driving the gameplay. During a free spin round, regular wild icons that hit the reels glue to their positions for the remaining free spins, so by the end of the round you may get a whole bunch of them. A scatter is portrayed by the Panda’s Eye. Three or more scatters appearing in any position trigger a free spin feature with ten free games. Five Panda’s Eye symbols displayed in any spot award the slot’s top jackpot of x7500 times a wager. The Lucky Nudge is a feature that may contribute to triggering the free spins. When a scatter is just visible at the top or bottom edge of a reel, it can be “nudged” onto the reel to act as a full-fledged scatter. During a free spin round you stand a chance to pocket as high as 1,800,000 coins! As in other slots of the Untamed series, the Gamble feature takes the gameplay out of the realms of the ordinary. After a winning spin you have an option to continue spinning the reels or try to increase your award by pressing the Gamble button. On the second screen you’ll see a globe divided into two sectors marked as Lose and Win. Use controls under the globe to set your odds by changing the size of Win/Lose sectors. If you make the Win area bigger, your chances to win increase proportionally, yet the bonus award will be smaller. Overall, you can gamble up to x20 times your bet. Untamed: Giant Panda from Microgaming is a must-play video slot for gamblers who opt to play 243 ways to win games. With a customizable Gamble feature, Brilliant Wilds, Lucky Nudge as well as regular wilds and scatters, Untamed: Giant Panda is a stunning money-bringing slot to suit all budgets.